My parents are teachers of English and Spanish. This unconsciously aroused in me an interest for foreign languages. It has made their learning easier 'Wherever you are coming from, we will understand each other perfectly"
This pass associated with my backround and my professional experience will offer you a guide with very special skills. Not only in the context of guiding but also with a sense of organization, mastering the principals of excellent service and customer satisfaction. To Celebrate the 2019 New Year, my friend and I decided to visit Morocco! We only had two full days, so we wanted to make the most of our time by seeing and learning as much as possible from an experienced private tour guide. 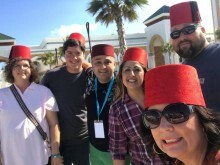 Thankfully, (after a thorough google search) i was delighted to find Achraf from Achraf's Private tours!...Prior to our arrival, we communicated several times via email about the details, and we were able to customize our two day itinerary in Tangier and Chefchoaeoun! The experience was top notch, and totally worth the price! Achraf truly loves his work and his country, and it shows! He is a fantastic guide with a fun personality, an excellent communicator, and a great story teller! He is full of interesting information about the unique and diverse culture and history of the people, the cities, and the country. Each day we were picked up and dropped off at our guest house and transported in a comfortable SUV with a very trustworthy driver. We saw many beautiful places in the cities and the countryside, learned a lot, enjoyed delicious authentic food, saw many fantastic local handicrafts, and took tons of great photos! 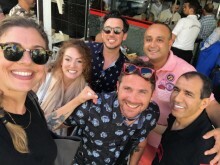 If you are looking for a truly memorable experience while in Morocco, then you need to book a tour with Achraf's Private tours! With Achraf you don't only get a wonderful tour of a fascinating country, you get a great friend for the day! !